In general, nothing can be taken into the monoplace unit. This uses a 100% oxygen environment, and is therefore strictly monitored. Take nothing into the HBOT chamber unless you clear it with the technician. The multiplace HBOT treatment chamber uses air, and so is less stringent. 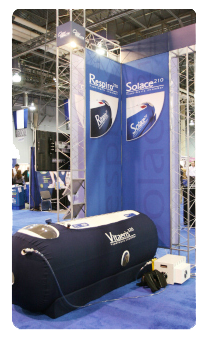 You can take water bottles and some books and magazines into this type of HBOT Treatment chamber. In both chambers, items such as lighters, matches, cigarettes, nylons, wigs, ointments, hearing aids, petroleum jelly, watches, makeup, lipstick, lip balm, hairspray, hair dressings, synthetic fabrics, or hard contact lenses are not allowed. Underwear items with metal, such as under wire bras, can be worn as long as they are covered by cotton clothing. If you have a wound dressing of any kind, the technician must exam it before you enter the chamber. HBOT Treatment Chamber – General Rule: don’t take anything into either chamber unless you have been specifically told that it is safe to do so. Inside the HBOT Chamber – What Is It Like To Get An HBOT Treatment?